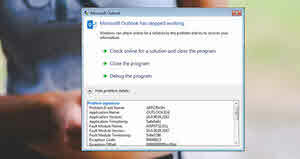 If you encountered this error, first try to run the Outlook application in safe mode. If it runs fine in safe mode, this could be because of some installed add-ins. In such case, try disabling the add-ins one by one to find the one which is causing this crash. In case it's crashing even after running Outlook in safe mode, open the scanpst tool and scan the Outlook data file to check and fix any errors. This is often the root cause behind this crash. If the tool reports any data file error, fix it first. If you are still facing this error, you may have to repair the mspst32.dll file. To do this, search for the file in this location: C:\WINDOWS\system32\mspst32.dll and if it is there, rename or delete the file and restart Outlook. You may also try by creating a new Outlook Profile. If you have come this far, it means that you liked what you are reading (Outlook crashes due to Fault Module: MSPST32.dll, and here's how to resolve this error).